In our mission to find enough prefab homes, modular homes, tiny homes, cabins and other options so that everyone will see enough that they can find the best one for their needs and have their own home, we came across this tiny house based on the boxy design that makes is simple and uncomplicated. It’s a southwestern-style tiny house — look at that plain timber siding for the top, brick design on the bottom, and on wheels, as you can just barely see, hidden behind a flower pot and the small slide out deck. Nicely, that slide out deck steps up onto the larger outdoor sun-deck on the back of the tiny house, which has a large window into the inside. Actually, there are large simple windows around the structure, letting in a good quantity of sunlight and venting hot air. 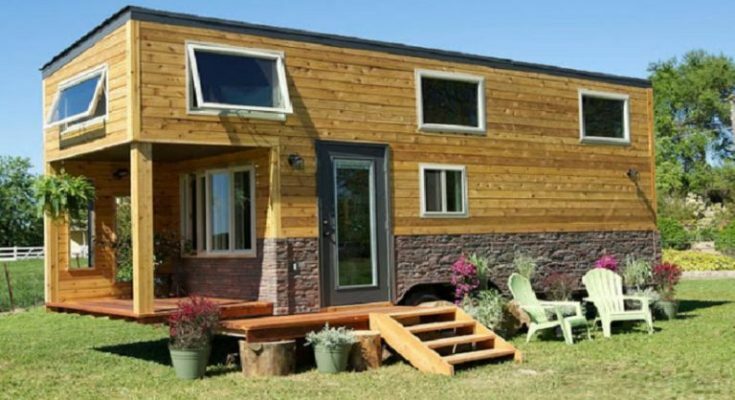 This tiny house is a one bedroom, and it has a full kitchen, a living/dining room in addition to the loft and bathroom. How big would you guess for this tiny house? 170 square feet. It’s tiny, alright, but it suits its owners, who live on a farm with it. If this tiny house isn’t enough for you today, check out the Building Homes and Living directory, where we’re adding links all the time to more designers and builders.